Maui has become one of the most popular destinations for those searching for the perfect tropical vacation. 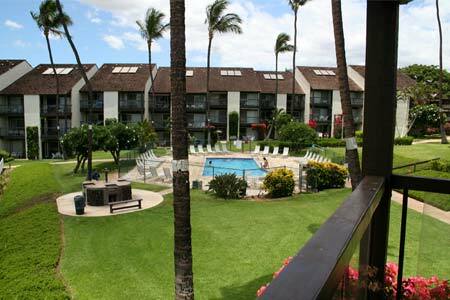 Hale Kamaole condos are located in Kihei on the sunny southwest corner of Maui. This ideal location puts you within a short distance to all of the islands amazing attractions and is only 20 minutes away from the Kahului Airport. Hale Kamaole offers some great ocean views and gorgeous tropical landscape. You can do some whale watching during whale season and you can also do birdwatching from your lanai and see tropical birds buzzing around including the Mynah bird (if your home is located next to tall palm trees, you will most likely see a nest there). When walking around the property you will come across some amazingly vibrant flowers like the Canna flower, It's a true paradise. The Hale Kamaole luxury condos are privately owned and each offers a uniquely personal touch to make you feel relaxed and right at home during your stay. Each condo is completely furnished with a full-equipped kitchen and private lanai to relax and enjoy the amazing sunsets over the Pacific Ocean. The resort grounds are spacious and beautifully landscaped with lush tropical plants and feature tennis courts, swimming pools, barbeques and amazing views of both the Pacific Ocean and near by mountains. Located directly across the street from the world class beach know as Kamaole beach III. Hale Kamaole condos offer you the perfect jumping off point whether you are in search of adventure or a day of relaxation. Within a short walk or drive there are boundless opportunities for the outdoor enthusiast. Snorkel right out front and experience bright skoolz of fish including but not limited to 4 Spot Butterfly fish and Rainbow Wrass. Surf or paddle board, take a fishing or diving tour or spend the day shopping at the Shops of Wailea or any of the nearby locally owned unique stores. There are also a number of championship golf courses close by. Simply said there is something for everyone at this Kihei lodging choice. Each guest of the Hale Kamaole Resort has their own idea of the perfect tropical vacation. Whether it’s spending the day relaxing with a book under a shady palm tree or out tackling the magnificent waters of the Pacific Ocean, our prime location puts you within easy reach of it all making this the perfect choice for your dream vacation. The Hale Kamaole luxurious condos are located between Kamaole Sands and Maui Kamaole at 2737 S Kihei Rd, Kihei, HI 96753.